[New for 2011] Ok, this is not the review I had planned (that one is still just pictures and no words), but as I was reluctantly working on my taxes today, I had a sudden urge for something different. That, or maybe the graphic of the crumble inside the peach throws me off. On one hand I get what they are trying to say, but on the other hand, it doesn't make any bloody sense. I'm probably being too literal, but I suggest Haagen-Dazs lay off the photoshop in the future. Ok, details, details. So this little 14oz fellow is spiced peach crumble. What does that mean? "Peak-flavor peaches are cooked to perfection, lightly spiced and stirred into a sweet cream with nuggets of butter crust". Mmmm, perfection and sweet cream, sounds tasty. Wow, that's a nice looking ice cream! Man, I wish I had some real pictures in my old B&J's Willie Nelson Peach Cobbler review so I could do a comparison. I love the look of the peaches, there is just something cool about them. I also like their varying sizes and the simple fact of how plentiful they are. Let's look a little closer since I haven't had much luck digging out the crust pieces for a penny test. They are very soft so I wind up scooping right through them. It's certainly a good looking ice cream, and after just a few bites, I have to ask: Why is this only 99 cents? That's right everyone, I really enjoyed this one right from the get go. Maybe I was in the right frame of mind today (after downing way too many cupcakes yesterday), but this one hit the spot. 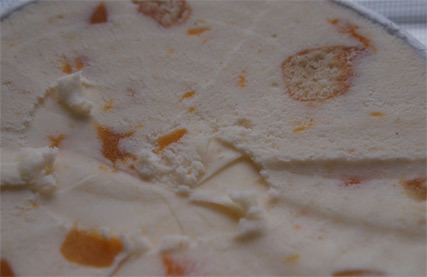 The peach and the sweet cream are spot on for a mellow sweetness that nails it on every bite. I figured I'd take a few bites and then move on, but wow, it's just so balanced, so refined, I'm really impressed. Instead of the Willie Nelson variety punching me with quality peachiness on every scoop, this fine flavor remembers it's an ice cream first and foremost. Hey, it's Haagen-Dazs, I should have know it would be excellent. The peach chunks are cool too. Most are small, but on occasion you get a nice little icy chunk to remind you they are there. I guess what really gets me here is how all those little bits delicately blend with the sweet cream. This is way smarter than a straight peach ice cream, or an overpowering peach swirl. I think we all kind of agree that sweet cream is getting a bit overused recently, but H-D has remembered what it's suppose to be used for, and that's blending two flavors to become one. Awesome call H-D.
More general thoughts? Clean, mild, pleasant, refreshing. This is easily the best peach ice cream I've had. I actually wanted a second serving (in fact I had a few extra bites for a little extra writing inspiration). I don't know, I've had peach before and it was pleasant, but there's that extra something special about how this one blends together that knocks it out of the park for me. It's got the visual appeal, it's got the great mild flavor, and then the solid H-D texture bottles it all up and sends it home. You know, I'm a berry flavor kind of guy yet I'm sitting here wishing the fat content was lower so I could justify polishing off the whole container. Go find this one if you can, and if it's 99 cents, consider getting two of them. Suppose to be a wal-mart exclusive. Could be why it was 99 cents. 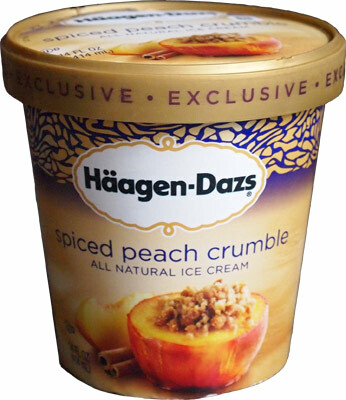 "Peach Spice" ...kind of made me Leary but....ugh....heaven in a carton...yes I would buy it and again..I'm such a fatty fatty two by four...lmaooo!! I tend to have a different opinion than you when it comes to evaluating ice cream, but I agree with you on this one. 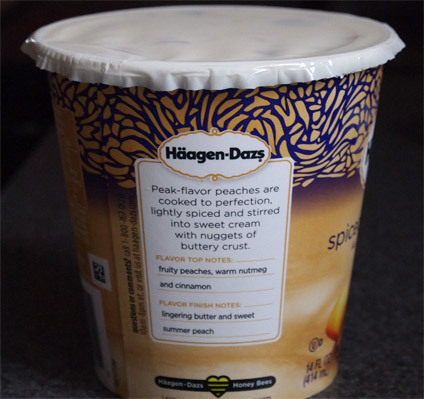 For those looking for either a strong peach flavor or large chunks of peaches, eat a can of peaches instead of eating this ice cream because you won't find a strong peach flavor in here, if any peach flavor at all. The bits of peaches were so small that a peach flavor was unnoticeable. You know they are present only when you come across an occassional scoop that has a mix-in with a slimy texture. But what makes this ice cream work is the mixture of the spices and the pie crust pieces that enhace the ice cream and makes you believe that you are eating a pie with your ice cream. 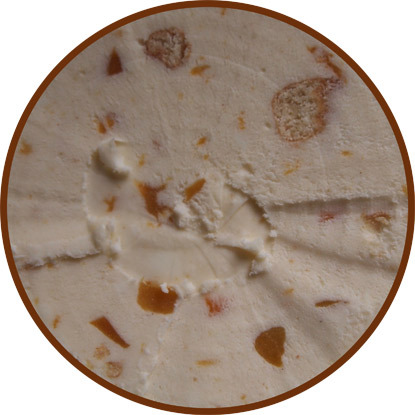 The spices have a flavor that reminds you of fall and apple pie while the pie crust pieces, some of which are soft and chewy and some of which are crunchy, provide additional sweetness, spice, and flavor to the already spiced ice cream, and because they are almost in every scoop they add texture and depth to this ice cream which keeps the ice cream from being boring. While Ben and Jerry's is my favorite, I actually liked the pie crust pieces in this ice cream more than I liked the pie crust pieces in Ben and Jerry's "Banana Cream Pie" ice cream. This ice cream was well done. Did it impress me? Not at all. But then again I am still searching for that Haagen-Dazs' flavor that will impress me. This is a good one to have during the fall season, especially if you want pie and ice cream together without going through the hassle of either baking a pie or buying a pie. I'm a BIG mix-in fanatic! :) And before purchasing this tantalizing pint, I was just wondering if you could tell me if there was a good amount ("a good amount" meaning ALOT haha)of crust pieces? For comparison, is there like as many mix-ins as in Ben & Jerry's Cinnamon Buns? or just a few like in Ben & Jerry's Red Velvet Cake?